Phil Martin may be a relatively new name on the local running scene, but the 35 year-old Bushfield Jogger has left an indelible mark, becoming a double national champion in the space of a few weeks. Hot on the heels of his gold medal winning performance in The British Masters Half-Marathon Championship in September, Martin also secured the British Masters Marathon title with a fine run in The Newcastle Town Moor Marathon on Sunday. 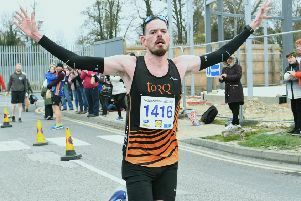 The Orton-based athlete recorded a time of 2:44.12, which was good enough to secure him third place but, perhaps more importantly, he was the first veteran across the line, in a race which incorporated the British Masters Championships.